As automation and the decline of manufacturing fuel fears of a coming age of mass unemployment, basic income—a government cash grant given unconditionally to all—has won wide support across the ideological spectrum, from Silicon Valley to labor. This issue asks what to make of such strange bedfellows. 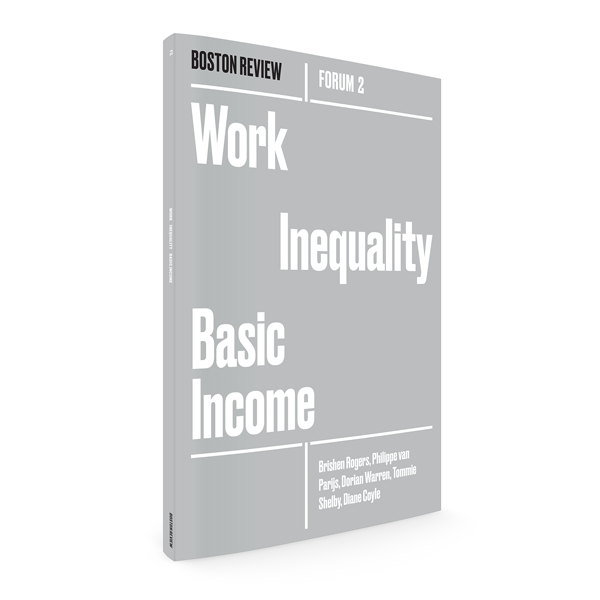 Some extol basic income’s merits, not only as a salve for financial precarity, but as a path toward racial justice and equality. Others caution that we must not forget to fight for the power of workers and the quality of work. Together these voices offer a nuanced debate about what it takes to tackle inequality and what kind of future we should aim to create. Forum contributors include Brishen Rogers (“Basic Income in a Just Society”), with respondents Patrick Diamond, Annette Bernhardt, Tommie Shelby, Peter Barnes, Juliana Bidadanure, Dorian Warren, Diane Coyle, Philippe van Parijs, Connie Razza, Roy Bahat, David Rolf, and Corrie Watterson. Also featuring essays by David McDermott Hughes (“A Jobless Utopia”), James Gray Pope, Ed Bruno, and Peter Kellman (“The Right to Strike”), and David Stein (“Why Coretta Scott King Fought for a Job Guarantee”), with poems by Ammiel Alcalay, Jen Fitzgerald, and Jill Magi.